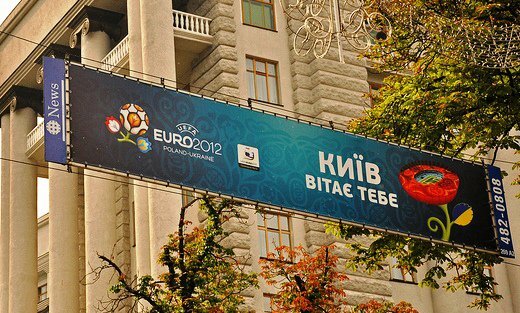 Ahead of the Euro 2012 football championships, media attention on political scandal and excessive profiteering has undermined Ukrainian attempts to raise prestige in the eyes of the world. Janek Lasocki and Łukasz Jasina wonder if the hosts will eventually be able to defy critics and secure a positive legacy from the tournament. On 1 July 2012 some 60,000 fans and officials will fill Kyiv’s Olympic Stadium for the culmination of the Euro Football Championships. With just a few weeks to go, media coverage has turned uniformally negative. Perhaps unsurprisingly, headlines have focused on a growing boycott of the Ukrainian half of the event by foreign dignitaries, who protest at the treatment of imprisoned opposition leader Yuliya Tymoshenko. Yet beyond the question of sport and current politics lies an equally important question of legacy: What is likely to happen to Ukraine and Ukrainians once the euphoria of final day has worn off? There is a lot of cynicism that inevitably accompanies large multi-annual expenditure on a single event, but it is possible to show that on many levels, international sports events can deliver real benefits for host nations. On a practical level, they can help bring forward capital spending and attract large scale outside investment to construct key facilities and, more importantly, to improve infrastructure like transport, accommodation, border control and the service industries. Nowadays few tournaments or Games actually make a profit (indeed Ukraine is not expected to) so it is this long-term investment that is sold to taxpayers as the key economic benefit. Sports events can also be important political symbols, such as the Olympic Games in Berlin in 1936, and in Moscow in 1980, or more recently the Olympics in Beijing and football World Cup in South Africa. All of these events looked to spin positive stories of expanding economies. Today, the huge influx of extra tourists and journalists, visits of foreign governments and billions of television viewers, means these are also a unique opportunities to affect the global brand of a country for years to come. With high hopes from both outsiders and taxpaying locals, a major problem comes in expectation management. While projects, laws and attention can be linked to these huge endeavours, the goal of host nation and organisers is ultimately more limited: to hold one successful event, not change a government or people. There are no political conditions attached to the role of host, nor obligations to improve anything for the long-term. From the very beginning of the bidding process for Euro 2012, many openly doubted whether Ukraine would be able to pull the tournament off. Reports regularly spoke of the threat to take it away from the country for its slow progress (and not on human rights grounds). In the end, however, the pessimism proved unfair. After a slow start, Ukrainians have achieved enough to confidently host all their matches as intended, with four stadiums ready in good time. 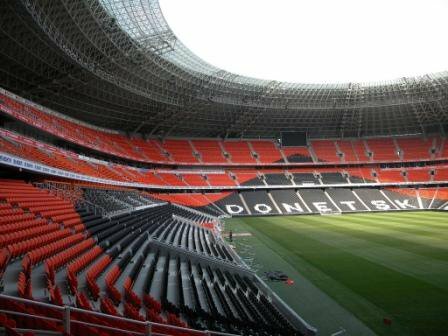 There are new arenas in Kyiv and Lviv; while major renovation took place in Kharkiv and Donetsk. Unlike stadiums after the South Africa World Cup or Olympic facilities in Athens or Barcelona, these parks aren't expected to end up as white elephants, empty and unused (Lviv being the possible exception), but will survive as busy football stadiums for already established teams. Ukraine has for a long time lacked the basic tourism infrastructure that previous host countries have taken for granted. Euro 2012 has therefore been used as a pretext to bring forward investment that otherwise would not have been spent. Transport and hotels have been improved. Air passenger capacity at the host city airports has been doubled following significant reconstruction work that includes new runways and control towers in Donetsk and Kharkiv, and new terminals at each of the four airports. After all this work, the capital's main airport at Borispol now resembles other modern European hubs. Apart from increased passenger capacity, this has opened up access to new airlines including low-cost Wizz-Air and RyanAir, and connections to a host of new European destinations, all of which are expected to stay in place after the tournament. Other transport upgrades have included new roads (in 2011 alone, over 2000km of roads were renovated), new buses for host cities and, significantly, the implementation of new 160km/hr superfast Hyundai trains on routes from Kyiv (a development that will see journey times halved). Over €2 billion has also been spent on building or rebuilding 80 hotels of all types, from budget to luxury. All this has provided a boom for the Ukrainian construction industry, which registered 10.7% growth In 2011, providing additional jobs for approximately half a million people (according to official statistics). A conscious effort was also launched to improve English language provision with lessons provided to border staff, medical personnel and police (the interior ministry aimed to have 27,000 police officers speaking English by June) as well as new signage and tourist routes prepared in English. For all the successes, investment has not resulted in the massive transformation of infrastructure that some might have hoped for. Major investments have neglected non-host cities, and businesses not directly involved in the tournament complain without hesitation that money has been redirected away from important projects. Ukraine doesn't need another airport terminal, they say, and the money could have been better spent on building inter-city roads. Key roads, such as that from Lviv to Krakovets on the Polish border, remain unfinished. Many of the successes of the renovation programme also suffer from poor service support and communication. The much talked about fast trains, for example, may be running in time for visitors, but there is still no easy way to find out timetables or prices. Many of Ukraine’s investment decisions have been secretive, intransparent or made without the long term in mind. In Lviv, for example, a decision was taken to build a second, new stadium, rather than renovate that which was already being used. A second arena on this size will end up an economic burden for the town, and most people doubt its future viability (link in Ukrainian). The wisdom of the level of this spending (estimates vary between €4 - 10 billion) is also particularly questionable. Ukraine, already a poor country (average wages total around €290 a month), was one of hardest hit after the financial crisis, with industrial output sliding by more than 30% in 2008. $8.2 billion of domestic and external debt (4.5 percent of its GDP) is due to be repaid in 2012, for which Kyiv will need to turn to international financial institutions. But Kyiv seems more interested in trying to negotiate cheaper gas from Russia than cooperating with the IMF, which has frozen support because of the lack of political will to implement reforms. On top of these real economic concerns, corruption remains a big issue in Ukraine (ranked 152nd in Transparency International's 2011 Annual Index). It is reasonable to assume that the considerable growth in the cost of Euro 2012 projects above budgeted sums had a lot to do with kickbacks for tenders and contracts. It does not help the government's defence that procurement was not competitive - excused by lack of time. Many openly accuse the authorities of corruption. For example, the opposition MP Ostap Semerak has charged the government with embezzling up to $3.7 billion by subcontracting friendly firms at inflated prices and receiving kickbacks. But such claims are mostly difficult to prove definitively. Local opinion polls and promotional material from Kyiv underline the importance Ukrainians place in improving international prestige of their country. Great efforts have gone into making Ukraine both an attractive and 'normal' European country worth visiting for tourists, not to mention one worth investing in and developing business relations with. On both counts, Ukraine may well disappoint. For Ukrainians themselves, the symbolism of this year's tournament is unquantifiable. It has not been easy to build an identity for modern Ukraine, stuck between an integrating Europe to the West and a Soviet legacy difficult to shake in the East. Victor Yushchenko tried, somewhat controversially, with his historical policy building a national myth of the 'Holodomor' (forced famine in the 1930's), and the Ukrainian National Army of the 1940's. The football championships, offered a less divisive opportunity to work together and try to shine as a modern, European Ukraine. It was, at least in theory, something that could be accomplished by the whole country without Moscow or the West (co-host Poland had, in contrast, the distinct advantage of EU structural funds). And if things go well, so the logic goes, why not bid for the Winter Olympics? Up to a million tourists from over 100 countries are expected in Ukraine. Most have by now received their tickets in the post and are preparing their itineraries. The new airports and modern stadiums, comparable to any in Western Europe, are meant to impress, as are the unprecedented amount of enthusiastic volunteers (over 6000), and the fan zones and festivals on the margins of the tournament. There will be a “Dance of Fire” in Donetsk, and a “Kiev Beach Club”, with space to accommodate 3,000 campers and 20,000 festival-goers for live music and entertainment. For all these preparations, however, Ukraine's problem is that it is yet to prove itself for tourists, and having to disprove prejudice is not an easy task. 13 of the 16 national teams competing in the tournament have decided to set up their home base camps in Poland rather than across the border, some setting themselves up for long journeys by air. The test for visitors will be in governance capacity: How effectively can local administrations cope with the influx of people? Will the police be able to maintain order peacefully? Will there be enough information and ability to communicate? There is an understandable worry that the visitor experience will be ruined by any number of social problems one sports tournament could not hope to address: from bad service, dirty and poor infrastructure, to petty corruption from police and border guards. Preparations have been plagued by a number of unhelpful tabloid headlines — from alarmist reports about Ukrainian nationalists and the culling of stray dogs, but perhaps the loudest scandal involved the inflated price of hotel rooms in host cities. Michel Platini of UEFA himself was quoted saying that "bandits and swindlers" have undermined Ukraine's efforts by hiking up prices to exorbitant levels. Ukrainian organisers have repeated assurances about the availability of affordable hotel rooms, and hoteliers have been publicly reprimanded. Yet some football associations — including the English FA — have had to return part of their ticket allocation after being unable to sell their full share in cities with such problems of cheap accommodation. And rather than renting rooms in Ukraine’s most westerly host city Lviv, some fans have been booking in across the border in Polish Przemyśl instead. And then there is the political brand of Ukraine. For all the talk of the need to separate politics and sport, that was always a fallacy. Bidding to host such an event is intrinsically political and is in effect inviting the world to spend months examining the country and what it has to offer. If done successfully the rewards are great - a unique and massively positive PR exercise - but there are equally high risks, which in this case meant a spotlight on a deteriorating situation as regards human rights and rule of law. When Ukraine won the joint-bid it was considered to be on its way, albeit on a bumpy road, to democratic transition and Euro-integration. Undoubtedly Kyiv will be envying the experience of World Cup host South Africa, able to portray itself as a country emerging into the international community, having successfully faced its internal struggles. Yet if there's one face you remember from that tournament it is that of Nelson Mandela; this year, the face people will remember will be Yuliya Tymoshenko. The story of the fallen opposition leader — imprisoned after losing an election, and allegedly beaten while imprisoned in Kharkiv — is now known worldwide following comprehensive media coverage. The case of Tymoshenko is not an isolated case, however, but the final straw confirming a Ukrainian stereotype. Ukraine will now be illustrated with stories of growing corruption and authoritarianism - a failure on Kyiv's part to convince the outside world that they adhere to different standards than Russia or Belarus. Angela Merkel herself compared Ukraine to Belarus, which according to her are "still living under dictatorship and repression." The tragic thing for organisers is that for Kyiv this was a PR battle that could have been won. Even with the backslide to authoritarianism under Yanukovych, Ukrainians would find it hard to swallow being compared to their ex-Soviet neighbours. Repression of opposition groups is considerably less in Ukraine, where they hold seats in the Verkhovna Rada (Parliament) and appear on television, and are an electoral force to be reckoned with. Tymoshenko herself seemed a spent force after her 2010 electoral defeat and her party weakened - she has now been elevated to martyr. President Yanukovych has seemingly sleepwalked way out of his depth and it's clear there was never any clever medium term strategy - acting rather out of a personal vendetta, when the benefits of acting differently were so logical. 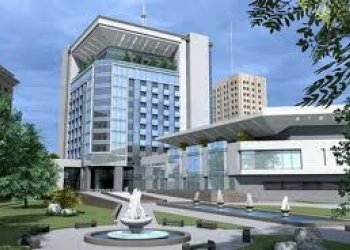 In Kharkiv local oligarkh Olexandr Yaroslavsky has built the Palace Hotel — a state of the art 5-star facitility — specially for Euro 2012 guests. Meanwhile, the rolling news has moved to how widespread the political boycott will be. A variety of ministers, presidents and whole European Commission will demonstrably not be going to Ukraine. For all the arguments for and against a boycott and its effectiveness, the key thing is that Kyiv has lost this PR war. For all the complications ahead of the tournament, however, Euro 2012 will help many Europeans place Ukraine on a map for the first time. This will mean unprecedented attention from both tourists and the international political community, both of which potentially bring big benefits – although perhaps not as the organisers expected. While the efforts to build modern tourism infrastructure should not be overlooked, it is also clear ambitions to rebrand Ukraine will not be fulfilled as some may have hoped. Headlines are clearly not encouraging investment or political cooperation, nor proving the country’s European credentials. That said, perhaps renewed international interest and pressure will continue into the autumn and bear fruit as October’s parliamentary elections approach. In just a few weeks’ time Ukraine will face one its greatest logistical challenges since independence. The question of legacy is especially important for Ukraine, and it will be a question that people will return to in the coming years. A lot now rests on how the country copes, and what will be the government’s next move. Whatever happens, this European Championship will certainly not be forgotten in a hurry.